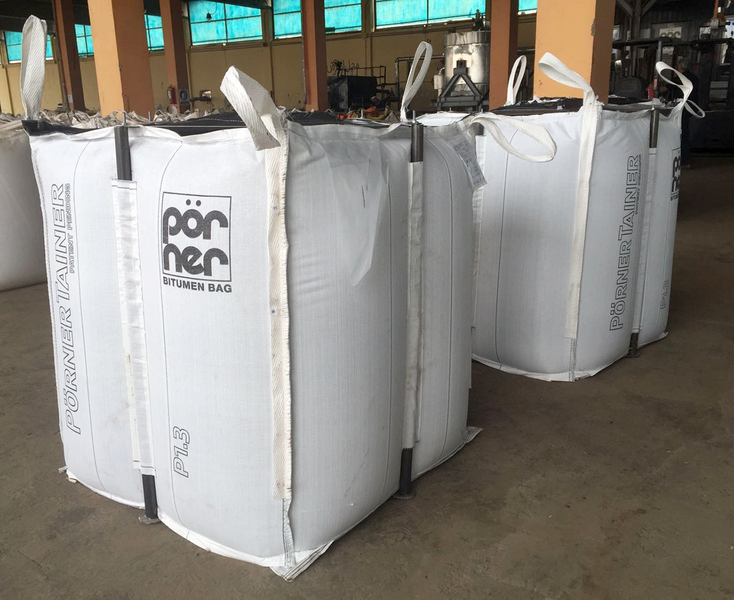 The patented innovative Pörner Bitumen Bag™ has been developed by Pörner Group. The bag is a self-stabilizing container made of plastic material, consisting of a multi-layer outer bag (recyclable) and an inner liner special-purpose film. The liner is melted together with the bitumen without changing its quality properties. The latest generation of bags includes a simple frame structure for extra stabilization to accommodate the larger mass. 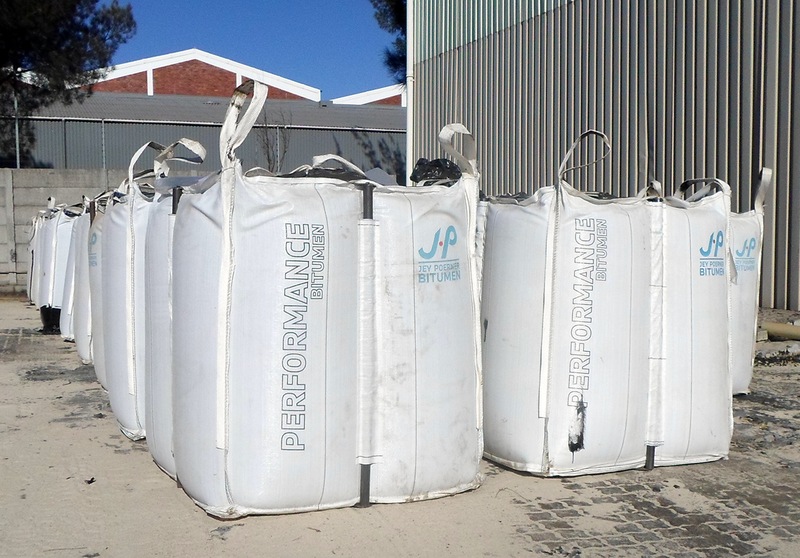 The Pörner Bitumen Bag™ is designed to carry up to 1,300 kg of road paving bitumen and comes in different sizes to fit the customers’ requirements. 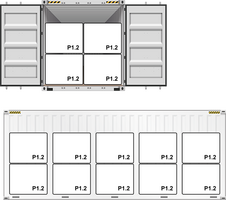 Its shape and volume is optimized for maximum utilization of containers and trucks. The bag can be transported by any common transport system (container, truck, rail) and is a one-way logistic solution. Therefore, the transporter can be utilized for other cargo on its return. The bag features UV-light protection and is suitable for every climate zone. It can be stored for up to 12 months*. The bags are supplied by Pörner’s ISO:9001 certified production facilities in Europe. 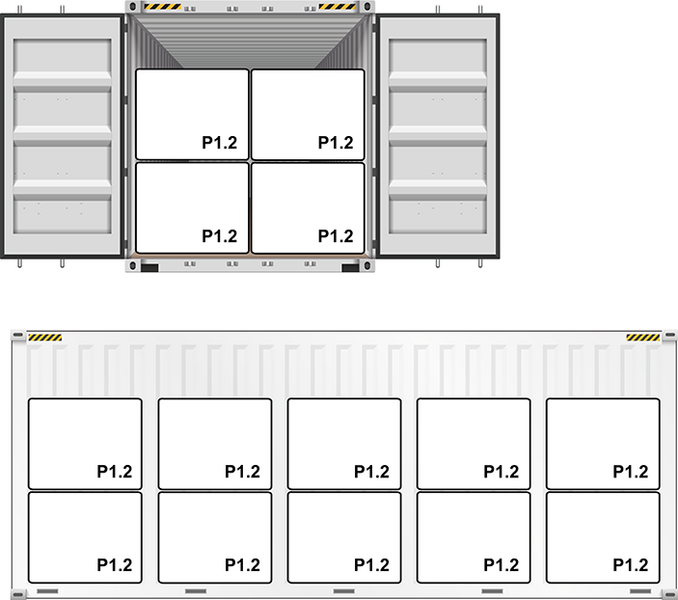 Illustrates how 20 Pörner Bitumen Bags™ (size P1.1) can be loaded in two layers into one 20 ft. container. 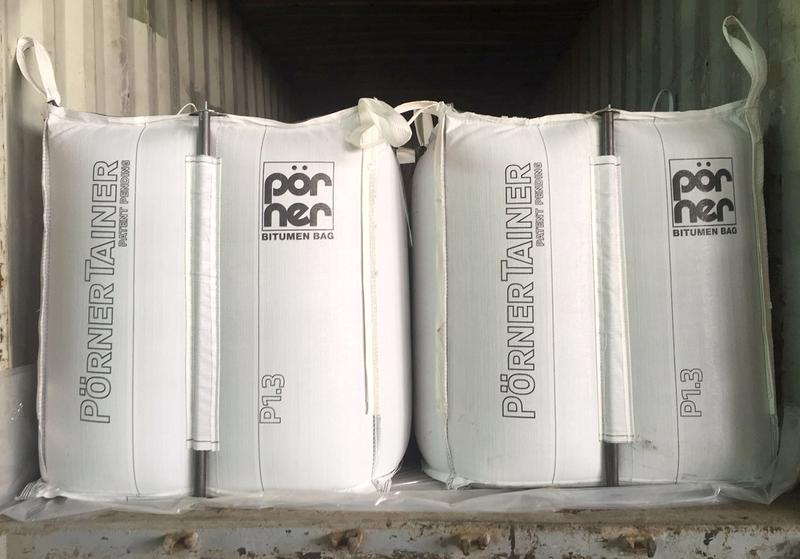 Illustrates how 20 Pörner Bitumen Bags™ (size P1.3) can be loaded in one layer into one 40 ft. container. The bag has built-in sleeves to be lifted and handled by a forklift (recommended min. 3 tons capacity). After filling, the self-stabilizing bags with the liquid bitumen are placed in the cooling/storage area to cool down (duration depending on ambient temperature). Usually, after 2-3 days, the bags are cooled down sufficiently to be transported. The bags are then loaded into containers (in up to two layers) with a forklift or the separate bags onto a flatbed truck. Upon arrival at the melting terminal, the bags are unloaded by a forklift and intermediately stored at the Melting Terminal. 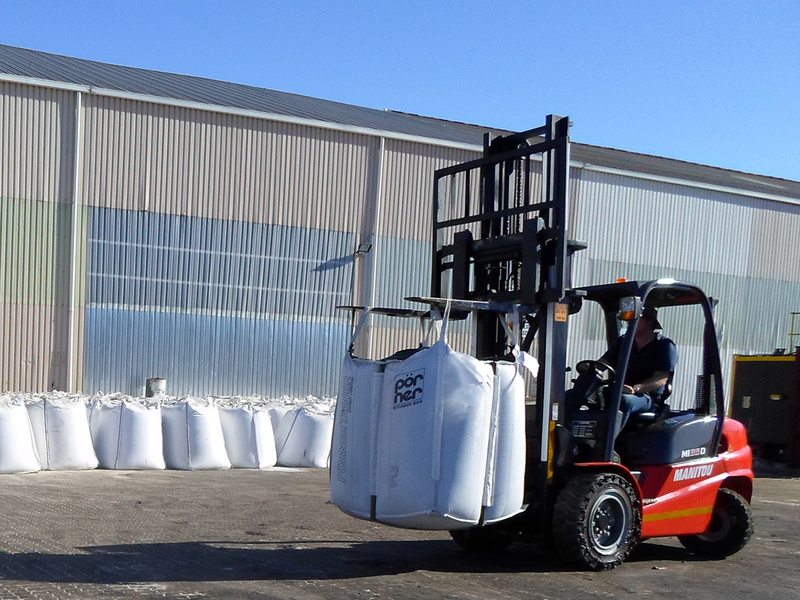 On demand, the bags are being moved to the High-Performance Melter (HPM). The frame is easily dismantled in seconds and the bag is lifted by the integrated crane on top of the melter. A worker cuts open the outer bag on the bottom and the content slips on the melting grid of the HPM. The melted bitumen is collected in a tank below and from there it can be pumped into the tankers for the “last mile”.